Engineering A Singular Future For Humanity : 13.7: Cosmos And Culture Human-machine integration looms on the horizon, with a promise to redefine who we are as people. Inventor and futurist Ray Kurzweil is an apostle of the coming Singularity, a time when it is envisioned that technology will advance to the point that life is redefined as something other than what we know and experience today. 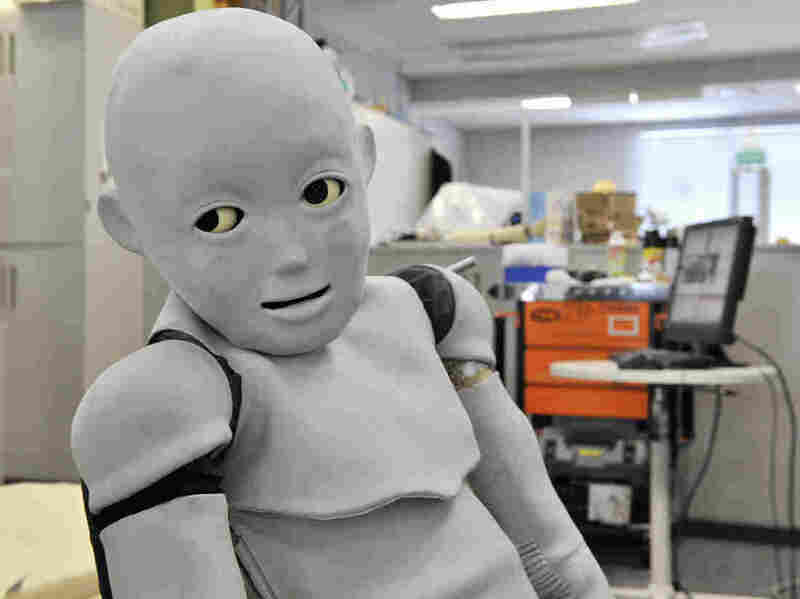 "Child-robot with Biomimetic Body" (or CB2) at Osaka University in Japan in 2009, where the android was slowly developing social skills by interacting with humans and watching their facial expressions, mimicking a mother-baby relationship. Last week I went to a lecture by the inventor and futurist author Ray Kurzweil, who was visiting Dartmouth College for a couple of days. Kurzweil became famous for his music synthesizers and his text-to-speech software, which are of great help to those who can't read or are blind. Stevie Wonder was one of his first customers. His main take, that the exponential advance in information and computer technology will deeply transform society and the meaning of being human, resonates with many people and scares a bunch more. For those who can afford it — and that's a whole topic of discussion by itself: what will happen to those who can't? — life will be something very different. Lifespan will be enormously extended, death will become an affliction and not an inevitability. I guess only taxes will remain a certainty! Are such scenarios sci-fi or the reality of the future? Take synthetic biology, for example, the ability to reprogram the genes of existing creatures to make them do what we want them to do. We might have bacteria create electricity and clean water from waste, produce blood, vaccines, fuels or whatever we fancy. We could recreate specific bodily organs to replace those that are malfunctioning, using your own DNA; boost your immunity against effectively anything; enhance intelligence and memory. Advances in the speed with which we read genomes have been so dramatic that we now talk about using DNA as a storage device. After all, DNA encodes information in very clear ways and we could manipulate it to encode any information we want. As George Church and Ed Regis write in their thought-provoking recent book Regenesis: How Synthetic Biology Will Reinvent Nature , in principle we could store the whole of Wikipedia (in all languages) on a chip the size of a cell, for a cost of $1 for 100,000 copies. Human-machine integration, in fact, is already happening at many levels: most people feel lost without their cell phone, as if a part of their body or self is missing. According to Kurzweil, by 2029 computers will be powerful enough to simulate the human brain. From his "Law of Accelerated Returns" he estimates that in 25 years we will have technologies billions of times more powerful than we have today. Just think that five years ago social media — today a transformative force in the world — was practically inexistent, or that the biggest computers in the 1970s were a million-times more expensive and a thousand-times less efficient than the chips we have in our smartphones, representing a billion-fold increase in computing efficiency per dollar. Singularity, in the case of black hole physics (Kurzweil's inspiration for the term), represents a breakdown point, where the laws of physics as we currently understand them stop making sense. This doesn't mean that there is an a priori reason for us not to understand the physics near the singularity, but that we currently don't have the theoretical tools to do so. In the case of artificial intelligence plus synthetic biology, the final alliance between humans and bio-informatics technology, it's much harder to predict what could happen. Every new technology can be applied for good or for evil (or both). If, as Kurzweil, we take an optimistic view and see how humanity has benefited from technology as a harbinger of things to come (we live longer and better, and although we kill more efficiently, we kill less), the Singularity will bring a new stage in the history of evolution, prompted by one of its creations: us. The body will be superfluous, since we are, in essence, coiled information, a blueprint, a sequence of instructions that can be duplicated at will. Will you then become a memory stick that can be inserted into a machine that can make copies of you? Or, perhaps, we will become a super-evolved character in a video game, an intelligent Sims person, convinced that the virtual reality surrounding us is real. After all, to simulate reality in ways identical to what we perceive is simply a matter of data gathering, advanced software, and processing power, all promises of this upcoming future. If this is what's next, and odds are it is, we should start thinking of the consequences springing out of humanity's redefinition. For one thing, it'll be important to make sure copies of yourself are backed up in a safe location. You never know when an evil mind might decide to delete you from existence! That's right, in this new future we won't die anymore; we will be deleted.